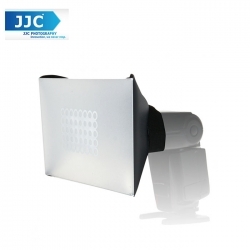 This CowboyStudio Universal Studio Soft Box Flash Diffuser is a great addition to any studio. This item is great for both amateur and professional photographers since it can be used with a built in flash. Flash diffusers are used in photography to soften the light that hits your subject. Diffusers help eliminate harsh light and can help leave your photos looking more natural. This helps to distribute the light more evenly in the photo, removing harsh shadows. One size fits all. The adjustable flash mounting shoe attaches by Velcro to allow for all size flash units.